I’ve recently started listening to audio books, mostly while I putz around the house. I was never sure if I’d enjoy doing this, but since I discovered that I concentrate better on cleaning and any other chore that doesn’t use a certain part of my brain, I figured I’d give listening to stories a shot. And it works — my house is often much cleaner than it used to be, since I want to keep listening but need to find something to do with my hands. It works for longer car rides, too. Right now I’ve just been listening to young adult (Sarah Dessen) and funny stuff (Tina Fey) so it’s not as crucial for my concentration to be quite as full. Also, obviously, I’ve been reading (listening) a lot of Sarah Dessen. I never thought I’d like her, but her stories are sweet and tough some inner teenager part of myself. Then I discovered that a bunch of her books have overlapping characters, and now I’m kind of hooked. My grandmother went to Prince Edward Island a few months ago and of course read all the Anne of Green Gables books. I mentioned that I read the first one and would get to the rest eventually. She logically interpreted this as I wanted to borrow each one from her at exactly the same time, so now I have them all in a sack, on the floor, because where the heck are 9 books going to go? 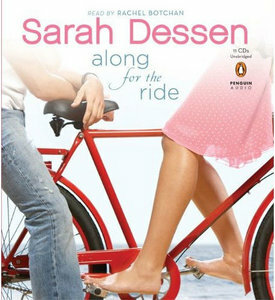 I love Sarah Dessen! I have her entire collection, but I never really considered audio books! I tend to get annoyed because I know I could read faster than they speak; but it’s a great idea for cleaning, or for car trips!